Probably the most advanced all-in-one GPS system you could install in your car; now updated with 8.2 million points of interest. The AVIC-HD3-II gives you the best in navigation and in-car entertainment. It will really change the way you and your passengers experience a car journey. The AVIC-HD3-II is a Double-DIN system which means that it’s twice the size of a normal car radio slot. 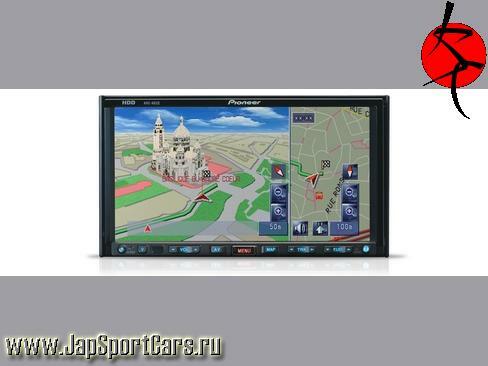 It has a large 7-inch touch screen, so operation and navigation is easy and safe. It has 30GB of memory; with detailed maps of 26 European countries already pre-installed. You can easily access the contact details of over 8.2 million points of interest, so finding a hotel, petrol station or tourist destination en route is simple. The AVIC-HD3-II intelligently recognises and stores your frequently-used journeys (so no need to re-input your regular routes). You can also avoid traffic; the system will alert and re-route you past the accident hot spots and traffic jams. An additional safety feature is the Voice Recognition feature. Not only does the AVIC-HD3-II speak to you, but you can speak to it; all the main features can be controlled by your voice. You'll never get lost again; the system always knows where you are. The AVIC-HD3-II uses multi-sensor navigation, including our unique 3D Gyro-Sensor. Even if the GPS signal is hindered, the system recognises where you are. So you get fast and accurate direction when you need it. You can also store up to 160 hours of music on the system’s Hard Disk Drive and select each track by voice. Control your mobile hands-free and be entertained through a versatile range of music formats – including the content of your iPod via an optional adapter. Your passengers can also enjoy entertainment from a different source to what you're enjoying in the front. Dual Zone Entertainment means that passengers in the rear can watch a DVD on optional screens, for example, whilst you're listening to the radio and using navigation up-front. If it’s the ultimate in in-car ease, comfort and convenience that you want, the AVIC-HD3 -II is the system you need.